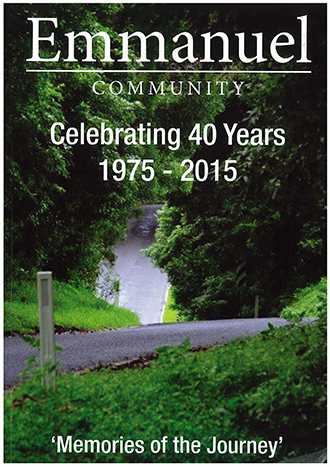 EMMANUEL COMMUNITY: CELEBRATING 40 YEARS 1975-2015, ‘Memories of the Journey’; Emmanuel Community; 2015. TWO years were spent researching records and collating photographs and time-sequenced stories and memoirs in order to preserve the story to the present of the first 40 years of Emmanuel Catholic Charismatic Covenant Community founded in Brisbane in 1975. Forty years of Emmanuel Community, on the one hand, is a chronological record of events containing reflections made by many people on aspects of the evolving life of a lay Charismatic community which has canonical recognition within the Church. Many who have contributed anecdotes have participated in serving in the mission and practical pastoral outreaches of Emmanuel Community to the Church in Australia and overseas while they responded individually to the call of the Holy Spirit to live in the covenant relationship to God and to one another. On the other hand, this attractively presented book containing many photographs draws the reader into an authentic experience of committed lay people of all ages and states of life, exercising the principles of a covenanted community where youth and the marginalised are empowered through mentoring programs and given confidence as active participants in mission and service. Ministries and outreaches particularly to youth and to the marginalised can be seen as the rich fruit of prayer while Emmanuel as a united group seeks to respond to the changing social needs beyond their community. National Evangelisation Teams, a ministry to youth has national and international involvements. NET provides formation in Christian life through personal transformation and commitment to Church teachings as well as leadership training and music ministry while encouraging youth to share the Christian message and to evangelise beyond the boundaries of parish. Sunday Eucharist is the source and strength of the unity that promotes covenant relationships in Emmanuel and enables remarkable achievements in mission goals. Since its beginning Emmanuel has been close to the heart of successive bishops who not only have been a point of consultation and reference but also firm in their encouragement. Within such a reassuring and supportive environment over 40 years members of the community opened themselves to risk-taking while acting with flexibility according to how they discerned God’s calling to mission and service. Several anecdotes by members reveal challenges that arose from some initiatives but significantly people’s unerring trust in God shows forth as they persevere in living covenanted relationships in order to serve the Church. Notably the trials experienced during the early growth, development and interpretation of the concept of covenant community are discussed with transparency. Styles of leadership have evolved over time but now consultation, collaboration and peer sharing are encouraged. The process of mediation to resolve issues of governance, leadership and pastoral roles and to seek reconciliation and resolution of issues is reported without bias by members. In this meticulously researched book wisdom of life and appreciation of the religious heritage of Emmanuel’s charisms gained and shared by senior members, through faithful involvement in the community, is being passed on. Additionally, the life-giving reality of Catholic youth experiencing and sharing their Christian identity with peers gives joy as their mission impacts beyond boundaries of community.